The prairie falcon is one the larger birds of prey inhabiting western North America. 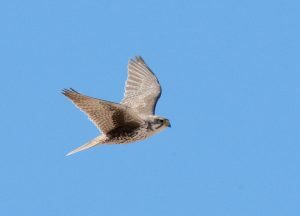 It looks rather similar in appearance to the closely related and distributed peregrine falcon, the difference being spotted in terms of their color, and hunting patterns. Size: Average size of this raptor is 15.7 inches (40 cm). Wingspan: They have a wingspan of 35.4-44.5 inches (90-113 cm). Weight: They weigh around 14.8-38.8 oz (420-1,100 g). Sexual Dimorphism: Female Prairie falcons are larger than males. 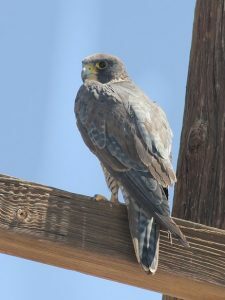 Plumage: The breast and belly are pale with brown marks; topsides are brown; primary wing feathers are dark, the rump and tail are light, the face has a mustache like a mark with a white line above the eyes, wing-pits and under-wing are black, except for the leading edge. 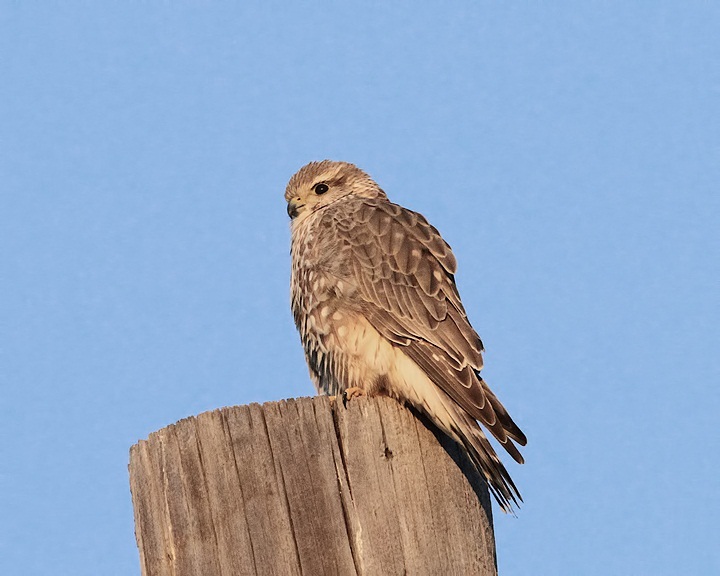 Juveniles have similar plumage but with dark streaked breasts and belly, and lighter gray topsides. 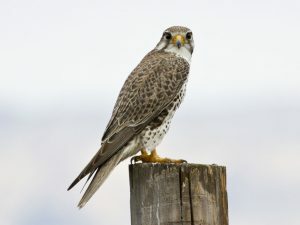 They can be found in open grasslands and forests of Canada during their migration in the fall and spring, while their winter habitat incude open deserts and grasslands. 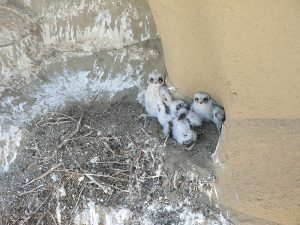 They breed in dry, open grasslands and use cliffs for nesting. 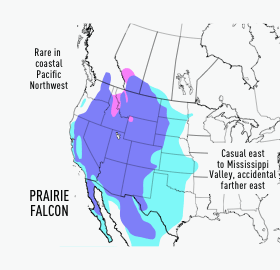 They live in Southern Canada, Western USA, and Northern Mexico. They are known to be aggressive birds, actively chasing away any intruders near their nesting site. 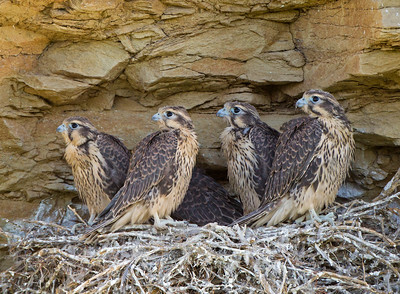 They are solitary outside of the breeding season. They are playful, often seen tossing dried cow dung from their claws and then going after the falling object to catch it in mid-air. They keep themselves clean by bathing in dust or even stagnant water if available. They are diurnal, returning to their abodes around 30 minutes before sunset. Their main hunting style is to fly at high speeds at low levels until it can spot its prey, before accelerating in flight during the final charge. 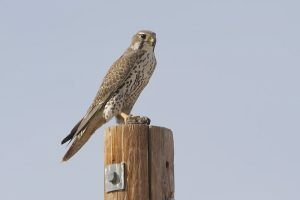 Prairie falcons are monogamous for a breeding season, which lasts from February until July being at its peak during April and May. They breed once a year, after which a nest or rather a scrape is created for the eggs. 2-6 eggs are laid at intervals of 2 days. Incubation lasts for about 30-31 days. Although the female primarily incubates the egg, the males also lend a helping hand in this regard. The chicks are cared for around 40-41 days, after which they fledge and subsequently become independent after around 65 days of age. Prairie falcons reach reproductive age at 2 years. On average they rarely live for more than 3 years in the wild. Prairie falcons make a sound that can be best described as ‘kree-kree-kree’. In general, three types of vocalizations have been observed, an ‘eechup’ call accompanies a courtship, cackling calls denote territorial and alarm calls and loud ‘chitterings’ are used during aggressive encounters. Their eat ground squirrels, smaller birds like pigeons, larks, mourning doves, blackbirds, larger insects, and reptiles. 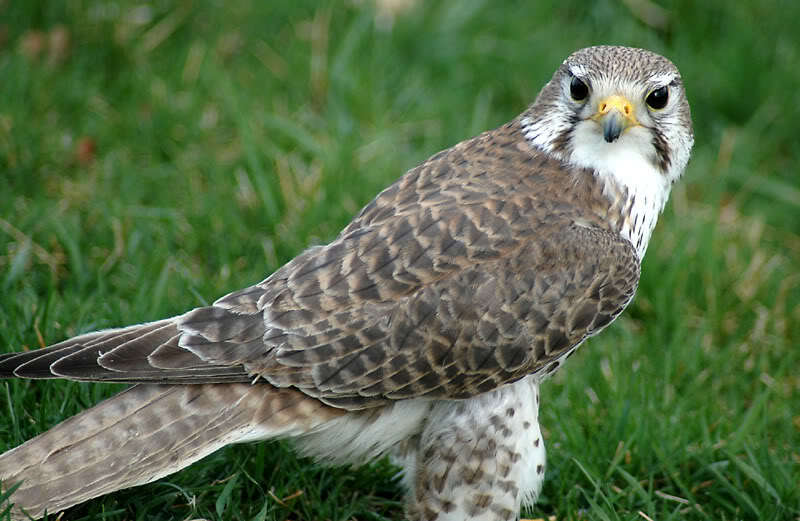 A special structure of the prairie falcon’s tail feathers lends it the ability to soar for up to 5 times longer distances by fanning out the tail and flattening the wings . 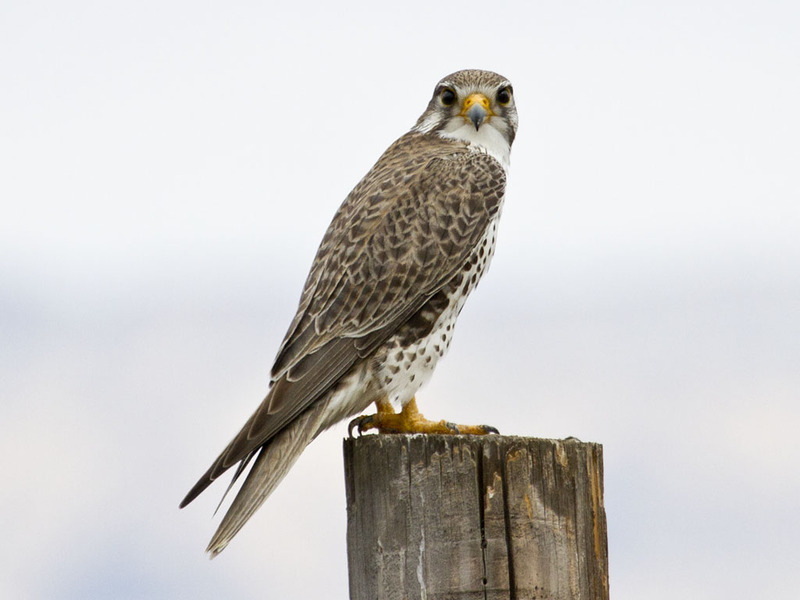 The plumage of the prairie falcon helps it blend in with the rocky cliffs and ledges that it nests in, thus giving it a nice camouflage from potential trouble. 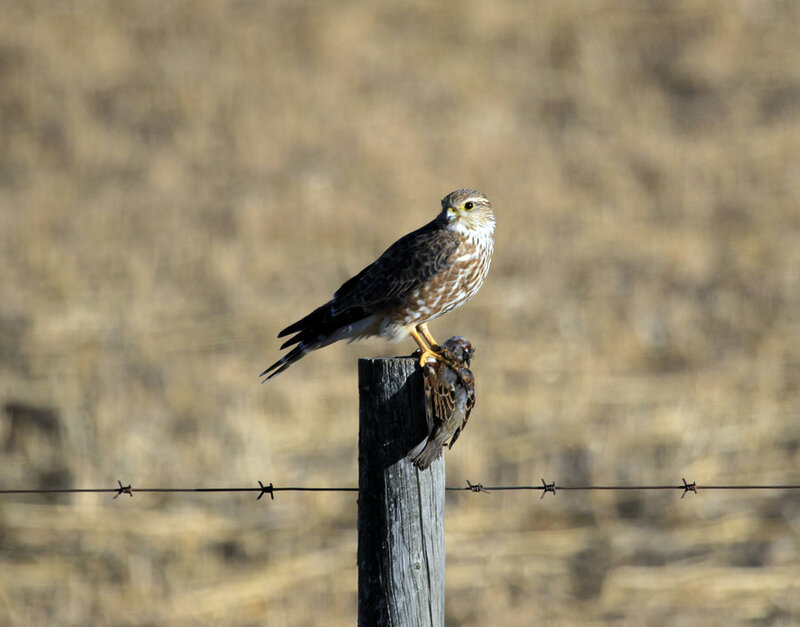 Great horned owls and golden eagles have been known to hunt and kill prairie falcons. IUCN Red list categorizes this bird as ‘Least Concern’. The prairie falcon is a popular bird for use in falconry, as with proper training from a young age it gets adept in hunting its quarry and returning to the falconer. 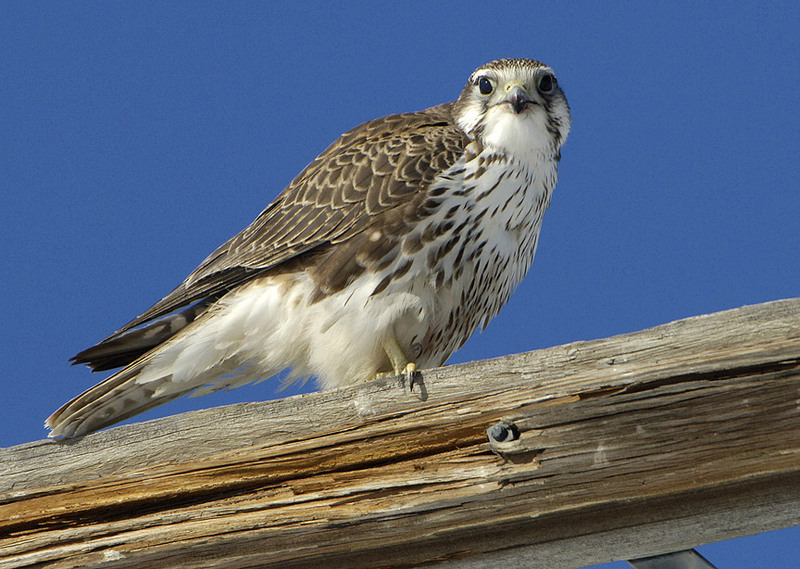 The oldest prairie falcon living up to 17 years of age died in 1992. It is also called the bullet hawk because of its speed in flight.